Mont-Saint-Michel and its surrounding bay consitute a unique site, accorded World Heritage Site status by UNESCO since 1979. Its three million visitors each year make it the most visited site in France. 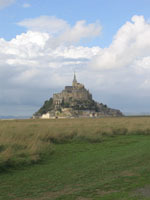 Mont-Saint-Michel is an extremely important asset in Basse-Normandie and attracts huge interest from French authorities and organisations. This is why a major project is now under way to restore the Mont’s maritime character by reversing the relentless silting up of its surrounding bay. Alongside this another huge project has been launched in order to preserve the quality of the bay’s landscape and promote its nature heritage. So it was that the association Les Chemins du Mont-Saint-Michel was founded early in 1998. Its aim is to locate and promote the ancient pilgrim routes leading to this famous sanctuary. With support from the EU, the French state, and local and regional authorities in Basse-Nornandie, the association offers a new approach to the Mont, reinstating its full cultural and spiritual rôle.